We had our first Thanksgiving yesterday. We have so much to be thankful for that it requires two celebrations! This year our second daughter and her husband will be celebrating the official day with his family. I am cool with the trades that happen as the family grows and we celebrate at an alternative time if possible. This year it was so and both daughters, their husbands and our grandson were here yesterday for Thanksgiving # 1. We pulled out all the stops, combined our cooking skills and created a feast. I created Tablescape #1. 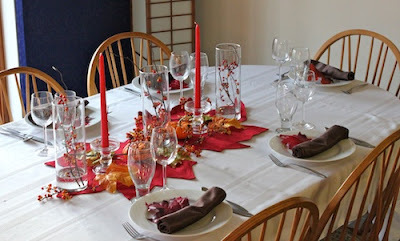 This year I will do different tablescapes for the two Thanksgivings. For the big one I have to set up two tables and need enough elements to match on both. I didn't need to worry about that yesterday. The arrangement was based on clear cylinders with bittersweet that I picked two days ago. It is a colorful addition to any fall tablescape. I especially like the crooked branches and the contemporary, oriental aesthetic it creates. 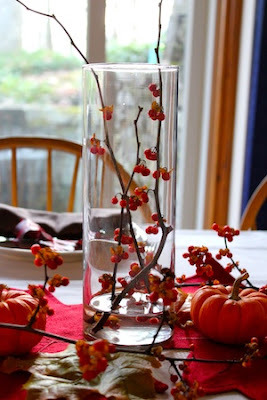 I like to keep centerpieces open and low enough to not interfere with table conversation. So many of the Thanksgiving arrangements are overly large and have to be removed for dinner. My preference is a simpler centerpiece and serving from a buffet area. We'll see if I have enough time to create another design for Turkey Day!